Can you tell your story in 6 words? More than 200 UAB students, faculty and staff attempted to do just that during this year's 2019 Say it in 6 competition. On February 28, 2019, the UAB Graduate School will announce the winners in both the student and faculty/staff divisions at a reception at Abroms-Engel Institute for the Visual Arts (AEIVA). Students will win cash prizes, while faculty/staff will win gift baskets. 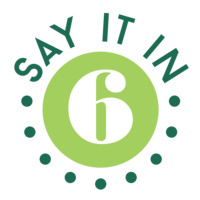 Say it in 6 is a competition hosted by UAB Graduate School that challenges you to tell your story in a creative and succinct way. Based on Smith Magazine’s “Six-Word Memoirs®” concept, Say It In 6 invites you to use only six words and a visual aid to tell a story – about your studies, your UAB experience, or your life. The five categories this year were UAB, Birmingham, Strength, Tradition and Happiness.